From unusual names to unique flavors, these craft breweries are tapping into some delicious creativity. Hop to it, and try the flavors that speak to you. This beer list is just a taste of all the crafts these brew masters have created. Visit all four of these fantastic breweries in the region: Bloom Brew, Four Seasons Brewing Company, Rivertowne Brewing, and Whitehorse Brewing. Each micro-brewery consistently perfects new varieties and tries out different flavor combinations all the time. With a consistent rotation, these fantastic brews might not always be available, but we hope they inspire a trip to the pub! Don’t miss the Russian Imperial Stout at Four Seasons Brewing Company. A fall and winter special blend, this bold choice is not for the faint of heart with its dark and complex combination of yeast and hops. Bloom Brew’s Black Dog, an Irish stout, pulls out all the stops with its dark, unique flavor. 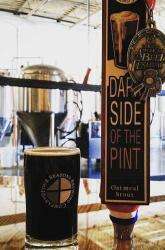 Dark Side of the Pint, a fan favorite at Four Seasons Brewing Company, is one of their signature beers, with a smooth, dark, roasted and coffee-like flavor. Named for the picturesque covered bridge in Somerset, Whitehorse Brewing’s Packsaddle Pale Ale is an amber colored delight with a beautiful hoppy blend. Subtle malt flavors with a hoppy touch make Babbling Blonde, an American Blonde Ale, a pleasant surprise for your taste buds. It’s waiting for you at Rivertowne Brewing. Down the Hatch, Bloom Brew’s chili pepper ale will knock your socks off. Chili peppers and Cherrywood smoked malt – need we say more? Taste the rebellion with Whitehorse Brewing’s Rebellion Red, a red ale that finishes like a fine wine. The burgundy colored ale is fermented with floated oak spirals. 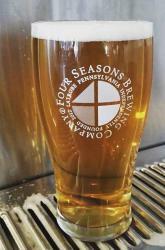 Make note of this seasonal ales at Four Seasons Brewing Company. The unique name winner, Das Boot Hefe-Weizen serves up a taste with a hint of bananas and cloves each spring and summer. 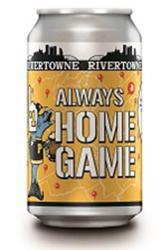 Go for gold with Rivertowne Brewing’s Always a Home Game. This golden, crisp beer is sure to delight. Rivertowne’s Grateful White, a Belgian Wit combines crisp coriander, sweet orange, and select grains to craft a can full of paradise. We’ve our hopes up for the High Hopes IPA at Four Seasons. Throw back a few of this very drinkable, pleasant floral hop without the bitter end. 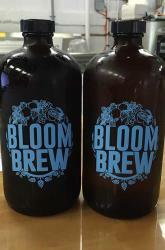 Head to Bloom Brew for an explosion of flavor in their Hoppyruption, an IPA brewed with four varieties of hops. Prepare yourself for four dimensions of flavor in Old Wylie’s, an IPA found at Rivertowne Brewing with quite the bite. The name says it all – Bang Bang, a double IPA features double the hops for a pronounced yet well balanced flavor created by Four Seasons Brewing Company. Rivertowne Brewing has managed to brew a taste of Hawaii and the nectar of the gods in one happy can. Hala Kahiki (hahlah-kah-hee-kee), a pineapple ale, rolls right off your tongue for a sweet and refreshing beer to wash your troubles away. We’re peachy keen on Bloom Brew’s peach beer, Peach Buzz, a fruity, sweet delight. All four of these breweries have an extensive and impressive collection of beers all season long. There are too many to list here! Get out, and try some of these tasty creations yourself. Be sure to share your favorite flavors with us!